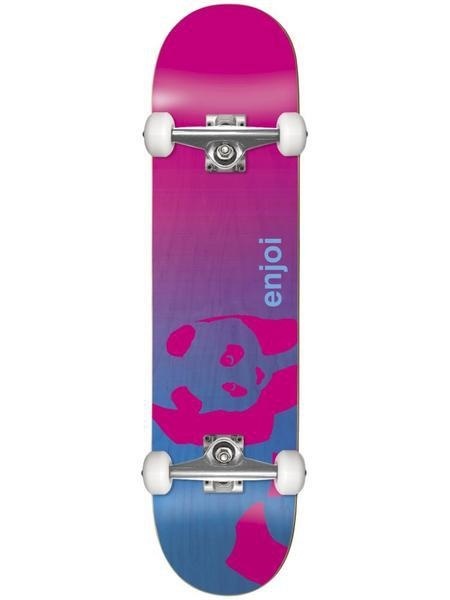 enjoi Faded Panda 6.5 Soft Top Resin Complete Skateboard MICRO Width: 6.5" / Length: 28.2" / Wheelbase: 11.75" Features: Soft Top: · Soft EVA foam top layer. Good for knee boarding and children learning to skate. MICRO Youth Complete: · Great for 5 years or younger. · Shape scaled for young riders. · Custom concave for more control. · Improved wheel formula for park and street. · Softer bushing for easier turning. Resin Complete: Specifically designed for durability and performance. The Resin deck is lighter and keeps it’s pop longer than normal water based decks. · 7-ply 100% Hardrock Maple with Epoxy Resin Glue. · Single Deck Press (Same shape and concave every time). · Carbon Steel Speed Bearings. Why its Better: · Stronger and lighter than industry standard completes. · Improved wheel formula for park and street. 90 Day Warranty Against Warpage and Manufacturing Defects.